21 Eight days later, when the baby was circumcised, he was named Jesus, the name given him by the angel even before he was conceived. 22 Then it was time for their purification offering, as required by the law of Moses after the birth of a child; so his parents took him to Jerusalem to present him to the Lord. Unspecified by Bible. Mid morning. Sunlight from the east (right hand side of this scene) can be seen on the right hand side of the figures. Joseph, the husband of Mary is leading their donkey. Mary is riding their donkey, holding the infant Jesus. The circumcision of the baby Jesus probably occurred in Bethlehem, 8 days after his birth. According to the Mosaic Law (the law handed down to Moses by God), for forty days a woman was considered unclean after the birth of a child. For this reason Mary, as a sinner, had to bring a sacrifice to the Lord in the Temple in Jerusalem, to atone for her uncleanness. 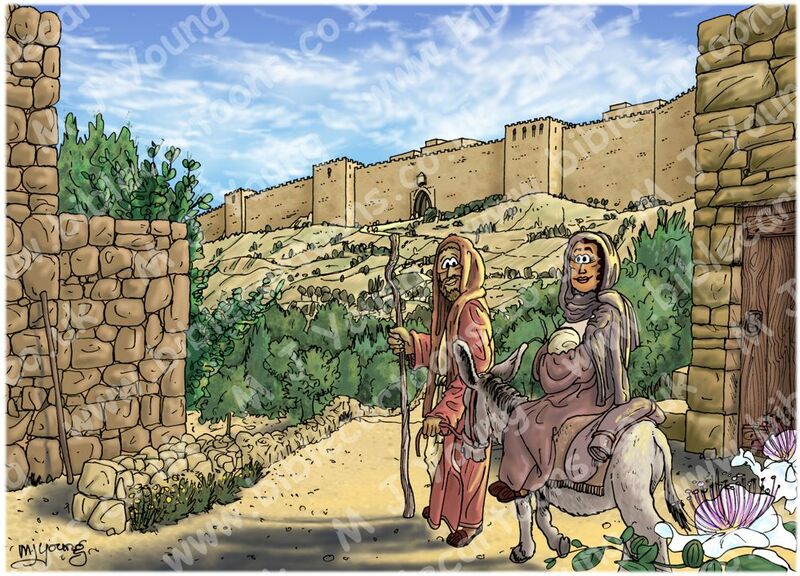 This scene shows Joseph, Mary and Jesus going toward the walled city of Jerusalem, in southern Israel, where she would offer that sacrifice. Mary and Joseph, carrying the bay Jesus would have walked to Jerusalem, and then navigated their way to the Temple. They would have walked across the largest courtyard, called the court of the Gentiles. It was here that Jesus overturned the money changers tables (see Matthew 21:12-13; Mark 11:15-17, Luke 19:45-46; John 2:13-16) later in his adult life. The holy family would have walked through the court of the Gentiles and stopped to buy their 2 turtledoves or two young pigeons sacrifice, before proceeding through a gate into the inner sanctuary inclosure, where no gentile was allowed to venture, on pain of death. The inner sanctuary inclosure comprised the court of the women, the court of Israel and the priests’ court, with the temple itself in the very middle of the whole courtyards structure. Women were not permitted to go through the gate beyond the court of women, so all of the scenes that make up this collection (Luke 02 – Prophecies about Jesus – scenes 01-06) must have occurred in the court of women. Mary offered two turtledoves or two young pigeons, as a sacrifice, (verse 24) which suggests they were not wealthy, since Leviticus chp 12:8  states that “If a woman cannot afford to bring a lamb, she must bring two turtledoves or two young pigeons.” Joseph and Mary offered pigeons, so their relative poverty could be assumed from this fact. Notice that this sacrifice was for the purification of Mary, not for the child. Following the Mosaic Law and customs, Mary would lay hands on the pigeons, then a priest from the temple would take them to the southwest corner of the altar, wringing one bird’s neck as a sin offering and burning the other as a whole burnt offering. As stated earlier, the offering of the sacrifice was to atone for Mary’s uncleanness, not the babies. As far as we know, Jesus never offered a sacrifice himself during his life time on earth. Flowering plants in this scene. The small yellow flowering bush, by the walls of the track, is Oriental Flax, one of several species that grows in the Judean Mountains. Related to this species is the cultivated flax (Linum usitatissimum ), which differs from Oriental Flax in that it has blue flowers. Since ancient times cultivated flax has been a source of linen fibres, extracted from the stem, and of linseed oil, extracted from the seed. The white petalled flower in the right foreground of this scene is the Common Caper, also called Flinders rose, a perennial plant that has Biblical connections with the walls of Jerusalem. 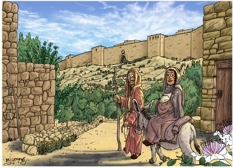 Nehemiah, who organized the reconstruction of the walls after the exile to Babylon, was assisted by Hanun, the sixth son of Zalaf (zalaf means caper in Hebrew). As well as growing on walls, the caper can be found in rock crevices and cliffs. The reputation of the Hebrew nation for its tenacity and ability to rise again after being cut back, is owed in part to comparison to this plant, which returns with new shoots even after someone has tried to uproot it from a wall. 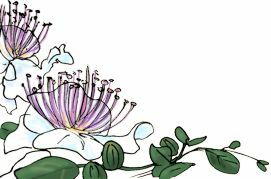 The unopened buds of the caper have been used since ancient times as a condiment (also known as caprisin). Pickled in salt and vinegar, caper buds are considered a delicacy. 6 “When the time of purification is completed for either a son or a daughter, the woman must bring a one-year-old lamb for a burnt offering and a young pigeon or turtledove for a purification offering. She must bring her offerings to the priest at the entrance of the Tabernacle. [a] 7 The priest will then present them to the Lord to purify her. [b] Then she will be ceremonially clean again after her bleeding at childbirth. These are the instructions for a woman after the birth of a son or a daughter.